. For many years, from 1955 to 1996 it was extensively but somewhat chaotically excavated by a redoubtable lady, Emma Khanzadian, who has now passed away and the site remains as her memorial. In the 1970s a museum was erected at the entrance to the site, and just outside the museum is a row of standing stones which have been brought together from various parts of the site. When we arrived, I immediately began to take photos, but they rushed out and said please don’t photograph it. This is a little silly because it is the most iconic site in the whole of Armenian prehistory, and photos of it are reproduced everywhere – you can see it on Wikipedia – so trying to stop people taking photographs of it is rather like shutting the gate after the horse has bolted. Fortunately I had already taken some good photos with my little camera. In fact there are two different types of standing stones. The majority of them, the smaller of them to the rear are clearly phallic symbols. 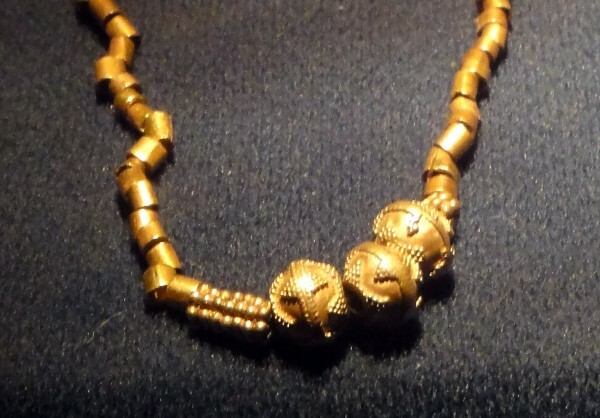 I don’t know their date but I suspect they are Urartian, in the 1st millennium BC. Much more interesting however is the single tall standing stone at the front which is a Vishap stone. 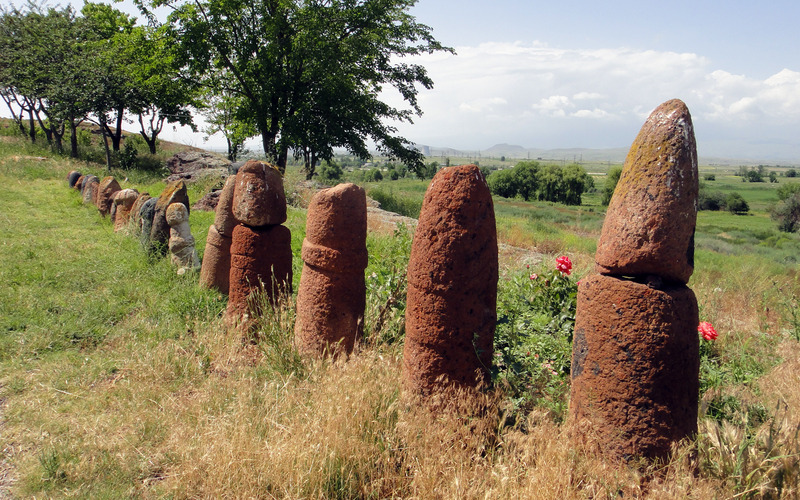 Vishap stones, or dragon stones, are among the most important monuments of Armenian prehistory, for they are fish shaped stones sometimes with a fish’s eye and flippers carved on them, though sometimes sacrificed bulls are engraved on them. They are associated with water and were often erected in at the sources of natural and artificial lakes and springs. 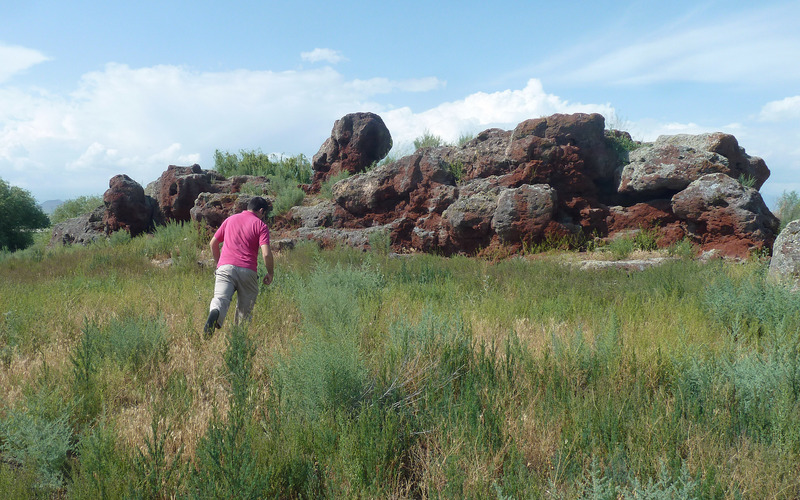 Vishap stones were sometimes put inside kurgans (barrows) and dozens of such stones have been found on the north-eastern shore of Lake Sevan, often in association with water engineering and construction of big and small artificial lakes and a complex system of canals joining them. They are one of the more interesting mysteries of Armenian archaeology. To the right is a splendid example now in the Sardarapat museum, but coming originally from the Kotayk region. Metsamor is a very extensive site with many different aspects and I will mention just four of them. 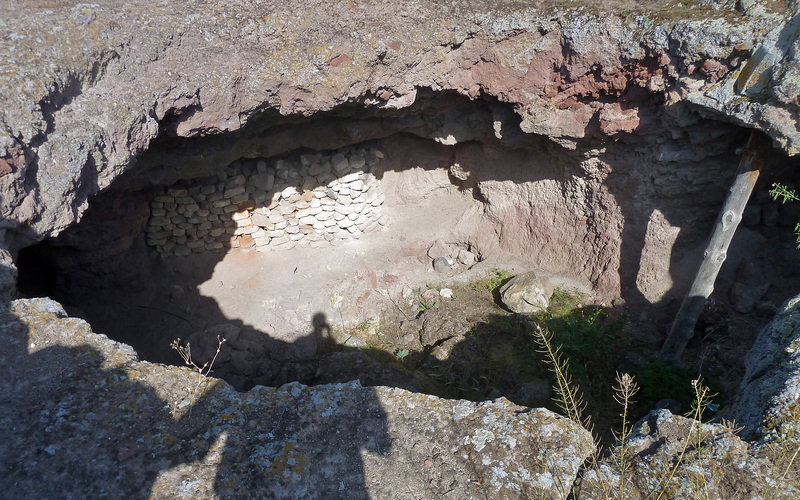 There is also apparently a smelting quarter, but we did not see this – and there was also a decrepit iron shed which apparently covered some temples. 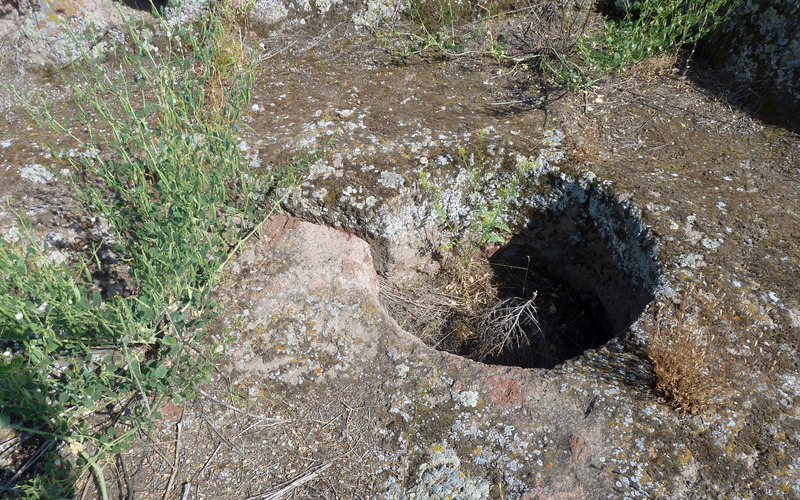 However what we did see were the remains of olive or wine presses, inserted into the floor of the quarries, presumably at a later date – see left. 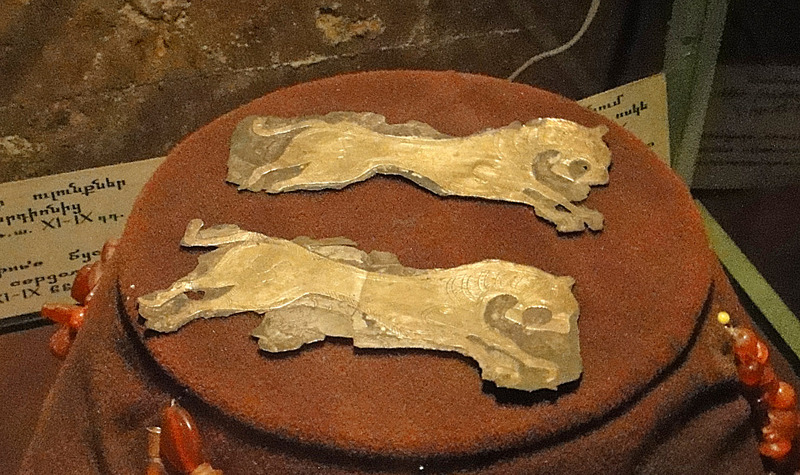 It would appear that the city was at its height in the Bronze Age when it was a major producer of copper, and presumably bronze, but that its raison d’etre rather disappeared with the introduction of iron. 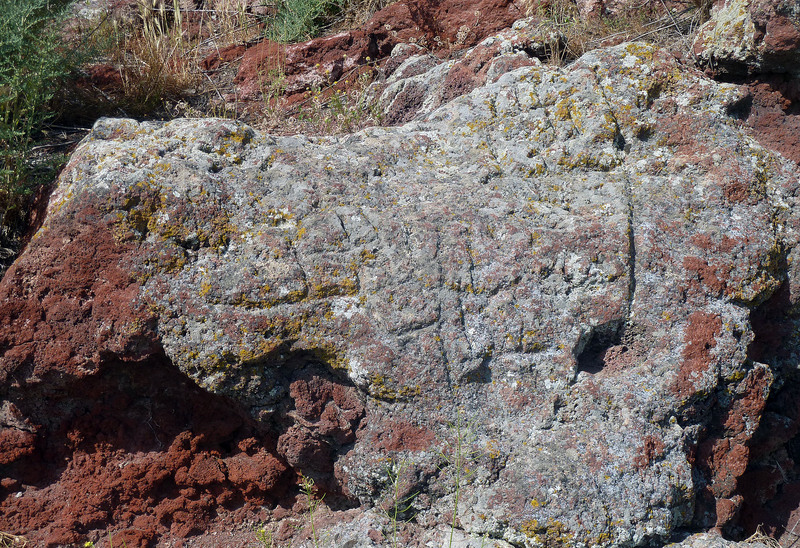 This rocky outcrop was covered with carvings and was clearly a sacred rock throughout much of prehistory. At a some distance from the main excavations is what is probably the most the best-known – or should I say notorious part of the site, an outcrop of rock covered with engraving in what British archaeologists would call the cup-and-ring mark style. However astro-archaeologists have had a field day here and have seen much evidence for astronomical alignments – for them it is a great ‘astronomical observatory’ complete even with the signs of the zodiac. There is also said to be a map depicting the water engineering in the Ararat Valley: I failed to find it. But there are an impressive number of carvings on the rock and it was clearly a major ritual centre throughout much of earlier prehistory – I suspect it should not be dated any closer than that. 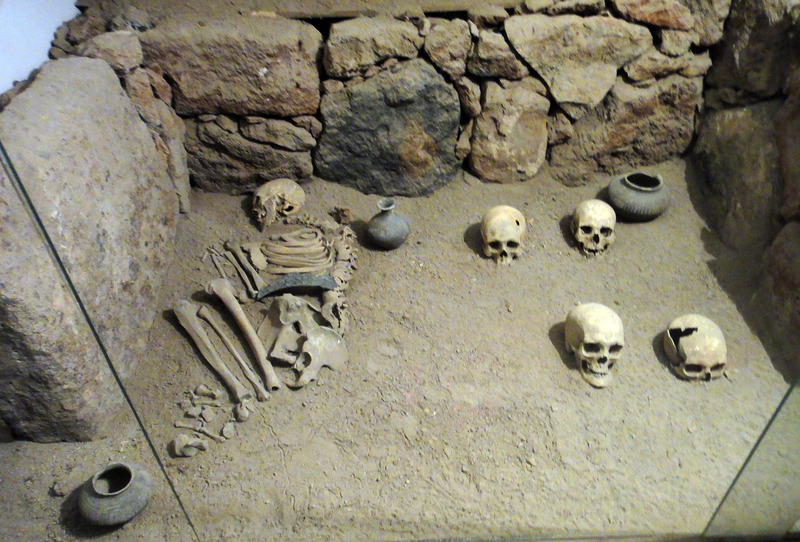 Finally there is the museum itself with a display of material from the excavations on the ground floor, but in the ‘Gold Rooms’ underneath there is a fine collection of objects from the very extensive excavations of a cemetery that ran from the 4th to 2nd millennium BC. There are many objects of gold and necklaces of carnelian, and there are even some objects from as far away as Egypt, testifying to the widespread international contacts in the 2nd millennium BC. Mme Khanzadian published a report on the cemetery – in French – but did not include a plan of the cemetery to show where the individual graves came from. Some of the treasures of the Museum. Top right. 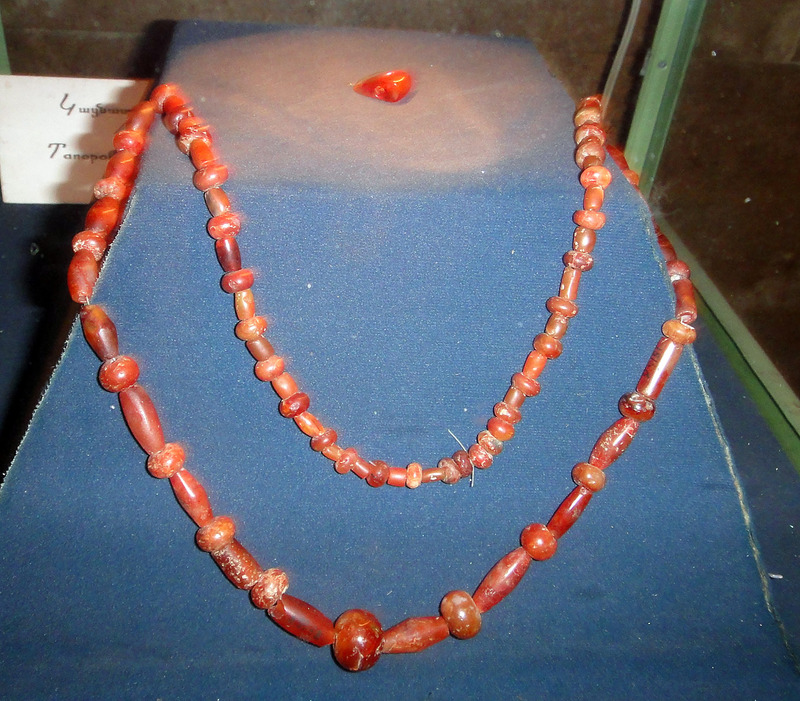 One of the fine carnelian necklaces.